A short comic about a girl who dies in the woods. A short comic drawn for the ‘A Little Red’ exhibition held by myself and a group of other Wellington illustrators. It is a bug sized retelling of ‘Little Red Riding Hood’. A short comic I drew in late 2017. It’s about the various legends of a beast that used to roam the Neverwood forest. 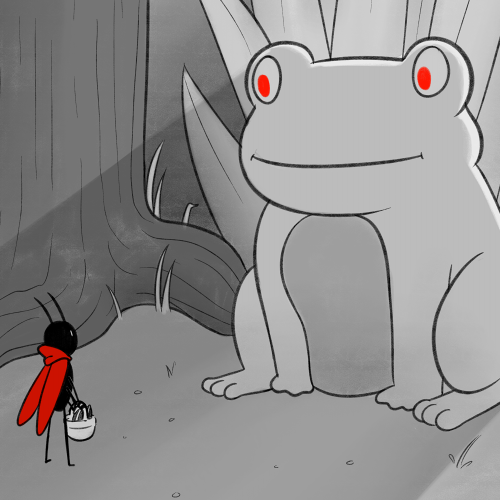 Sidequest is a webcomic about fantasy, friends, and avoiding your destiny. It was started in 2015, but has been on hiatus due to university commitments. I intend to continue it in 2019.